Solid lipid nanoparticles (SLN) have been formulated using various batch processes, e.g., solvent diffusion evaporation, emulsification solvent evaporation followed by size reduction using high-pressure homogenization (HPH) or ultrasonication. However, for the manufacturing of formulations, continuous processes are always preferred over batch processes since they are more efficient and offer better quality of the end product. Hence, we developed topical SLN of ibuprofen (IBU) using hot melt extrusion (HME), prepared a gel formulation, and performed its in vitro and in vivo evaluation. Effect of different variables of HME equipment and materials used in SLN was optimized using design of experiment (DoE) approach. Stable 0.48% IBU SLN with particle size 60.2 ± 4.81 nm and entrapment efficiency 90.41 ± 3.46% were developed which further gelled using 1% carbopol 981A. 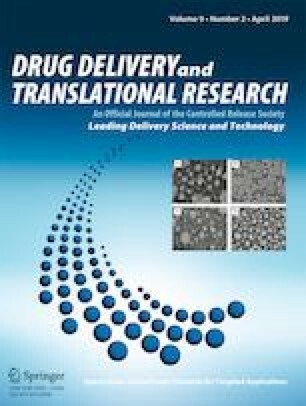 Drug release study, skin deposition study, and in vivo anti-inflammatory activity studies showed 84.37 ± 4.65% drug release, 12.05 ± 0.81% drug deposition, and 40.17 ± 2.41% edema inhibition respectively in case of IBU SLN gel (IBU-SLN-G) which was significantly higher (p < 0.05) than control IBU gel (C-IBU-G) with 50.11 ± 0.57% drug release, 4.11 ± 1.10% deposition, and 20.08 ± 3.23% edema inhibition respectively. In conclusion, HME offers a single step process for manufacturing for SLN which avoids high stress particle size reduction techniques used for SLN preparation. The online version of this article ( https://doi.org/10.1007/s13346-019-00632-3) contains supplementary material, which is available to authorized users. The Institutional Animal Care and Use Committee (IACUC) at Florida A&M University, FL approved all animal protocols that were observed in this study on 10th March 2016 (Protocol number: 016-03; Project number: 861412-3).